The tobacco industry spends more than $34 million each and every day in the US on its marketing efforts. The tobacco industry spends more than $34 million each and every day in the US on its marketing efforts. Combating this public health threat is a David vs. Goliath battle that requires Legacy to execute an innovative and completely integrated approach to marketing, advertising, and PR. "There is no safe level of exposure to tobacco smoke. Now let me say that again. There is no safe level of exposure to tobacco smoke." Spoken by Secretary of Health and Human Services Kathleen Sebelius in December 2010, these words kick off another chapter in the battle to save Americans from tobacco-related addiction and disease. Tobacco use kills 400,000-plus Americans each year. It also takes a significant toll on our families, communities, and our economy. For Legacy, PR is absolutely synonymous with public education. Despite nearly four decades of research, critical misperceptions about smoking exist. People still do not fully comprehend how difficult an addiction smoking is to quit, the myriad ways in which tobacco use causes harm from head to toe, or the significant economic toll tobacco use takes on our society through lost productivity and healthcare costs. Our PR efforts play a vital role in changing social norms and the knowledge level around smoking in America. That means constantly "re-framing" the tobacco issue to keep it relevant with the general public, the media, and other key stakeholders. Highlighting new research and creating products or programs to address this long-running issue are just two of the tools in our communications toolbox. As a foundation, we are probably best known for "truth," our youth smoking-prevention campaign. The decade-old initiative, which aims to keep teens from ever lighting up in the first place, prevented 450,000 teens from starting to smoke in its first four years alone. Those numbers have climbed ever since. The channels teens use to communicate with each other have changed drastically over the past decade, so our tactics must evolve. Our summer "truth" tour is a great example. Each year, a crew of twenty-somethings trained on tobacco facts, grassroots marketing, and media tactics travel across the US in distinctive orange "truth trucks." Through stops at popular summer musical and sporting events, they reach teens directly with life-saving messages. They give out fashionable "gear" containing tobacco-related facts. Crew members also tweet about their experiences and share videos and photos at thetruth.com, Flickr, YouTube, and on other social networking sites such as Facebook and MySpace. All the while, "truth" ads might run on TV or play in cinemas, while tobacco-related "games" are available on thetruth.com. PR enhances all this by conducting outreach to news media in every city visited, as well as tweeting to journalists and campaign followers, executing radio media tours and TV packages, and sharing photos and videos in our online press room and through social media. "Truth" is a powerful word. Through our communications, we shine a light on marketing practices by using actual tobacco industry documents that illustrate the sector's actions and behavior. The industry itself continues to provide fodder for our PR efforts. It still markets to teens via promotional activities, new products, or niche ads. Getting the word out to combat these dubious tactics is something we attack with relish. Beyond "truth," Legacy has funded innovative grants, conducted research, and has been a leading voice on some of the social justice issues surrounding tobacco use. To give life to such initiatives, we engage with many Americans who have lost loved ones or been touched by tobacco in some way. I know this firsthand, as I started smoking at a young age and then struggled to quit for more than 25 years. All the while, I saw my family suffer the consequences. Many of those left devastated do find solace in sharing their stories or those of their loved ones. Storytelling has been an effective communications tactic since the time of the cavemen. It remains just as powerful today. A legacy isn't something you leave behind when you die. You build it every day you live. At Legacy, we are working to harness PR to change social norms and save lives. 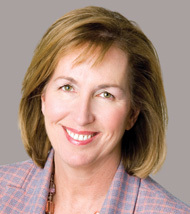 Dr. Cheryl Healton joined Legacy, a public health nonprofit, in 1999 as its first president and CEO. In addition to guiding the "truth" campaign, she has led numerous public education, research, and grant-making initiatives.